where |aibj is the basis vector in SAB with associated probability c*ij cij . The content in the following may involve some unfamiliar mathematics, especially the notations usually reserved for quantum theory; see "Short-cut to the Introduction of Quantum Theory" for quick reference. Correlation is about the dependence between two kinds of things labeled as x and y as shown in Figure 02. Some of them pair up randomly showing no discernible pattern (rxy = 0), while the other extreme would display a graph in the form of a straight line. 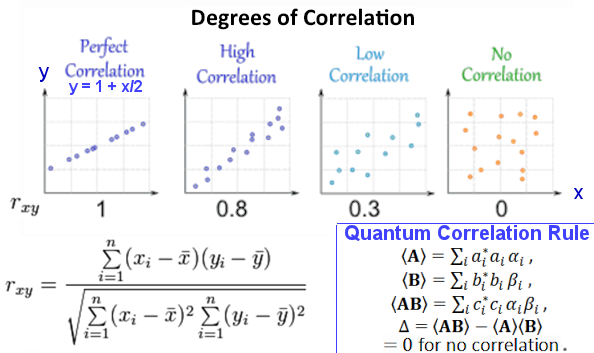 Thus, different system would exhibit different degrees of correlation, which can be computed by formulas such as the Spearman`s Rank Correlation. On the other hand, the Chi Square Test would provide just a "yes" or "no" after running the data with the procedure. The formula in Figure 02 is another way to estimate the degrees of correlation. It can be verified simply with the case of rxy = 1 by taking just 2 points (n = 2) at (0,1), (4,3) and the average (2,2). The quantum correlation is defined by the averages of observables which imply no correlation if the average of the products is equal to the product of the averages (Figure 02). The statistical nature of correlation always signifies incompleteness of knowledge about the system. For example, the radom appearance of a correlation diagram may be straightened up by knowing other external influences and making corrections accordingly. 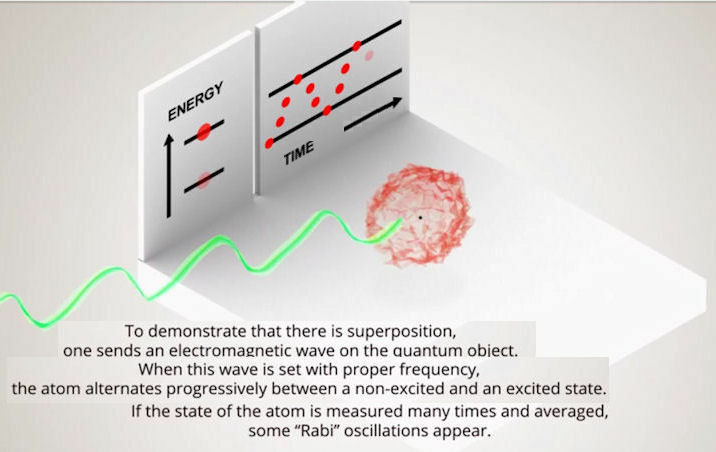 This concept is so ingrained in our thinking, it prompted Einstein to suggest that "hidden variable" is involved in entanglement between particles in space-like separation and generally in quantum theory. 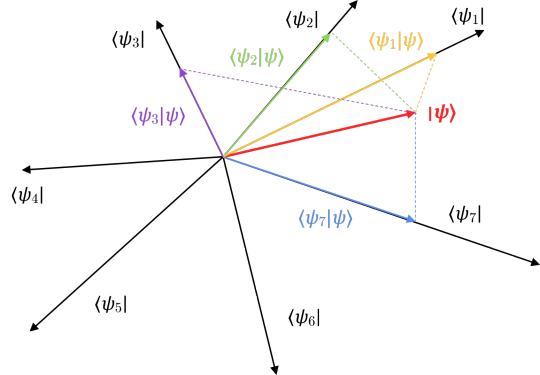 Modern tests on the Bell's Theorem have vindicated the quantum theory (with no hidden variables) to be correct. Actually, the seemingly fast-than-light action does not imply a message or information can be delivered that way, it is just an action involving the whole system. 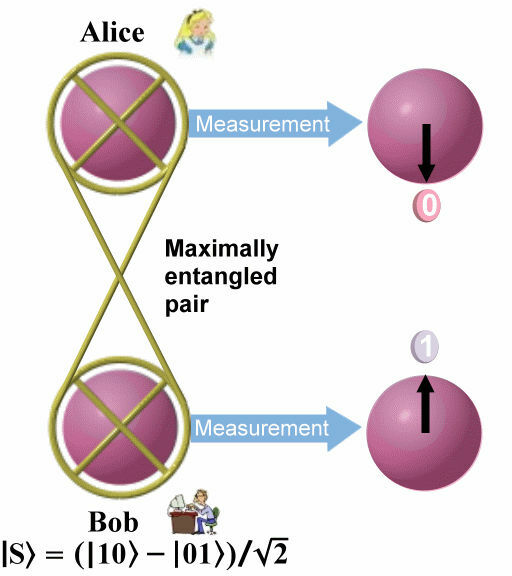 In the graphic example from Figure 03a, both Alice and Bob would not know each other's measurement until they have a chance to bring the data together and compare notice if they have not learned the intricacy of entanglement. Correlation in quantum theory is different to the classical counterpart since it does not involve hidden variable. This is known as entanglement. In the decay of the pi meson into an electron-positron pair (Figure 03a), since the spin for the pi meson is 0, the spin for the electron-positron pair must be opposite according to the conservation of angular momentum. Therefore, no matter how far apart are the members of this pair, if one spin state is measured for one of the member (collapsed from the superposition state), the spin for the other member will be the opposite at precisely the same moment. This non-local influence (non-locality) occur instantaneously. The following description uses these two spin spaces to illustrate some of the mathematical properties. The spin state is labeled as 1, or 0 corresponding to up or down (u, d) in some literatures. E(A|B|C1|C2|C3| ... Cn) = E(A|BC1C2C3...Cn) - E(A|B) - E(A|C1) - E(A|C2) - E(A|C3) - ... E(A|Cn) 0. It shows that A (Alice) can entangle with a lot of qubits such as those in the environment or measuring device provided it is not maximally entangled with any one of them. Those non-maximal states are mixtures of the Bell (pure) states (such as the |S> and |Ti>s). The monogamy has something to do with the "No-cloning Theorem". It is the special case of E(A|B|C) = 0 as illustrated in Figure 03c. See footnote for a copy of the explanation related to monogamy from "Limitations to sharing entanglement". See possible coupling mechanism in "Entanglement of Spins". called decoherence and can be explained mathematically in the following as transfer of entanglement to all kinds of particles in there. That is, the probabilities become additive corresponding to the OR operation. Each term in the summation represents the probability of measuring the state | i> by an instrument. Since the quantum state | > can be a combined system such as the entanglement of many qubits, the entanglement also undergoes decoherence. It is sometimes referred to as transfer of entanglement to the environment. separated into many different levels. An absurd scenario can often be concocted with the so-called "thought experiment" by mixing up the various levels (see Effective Theories). Although it is not an entry in most dictionaries, teleportation is very popular in science fictions. 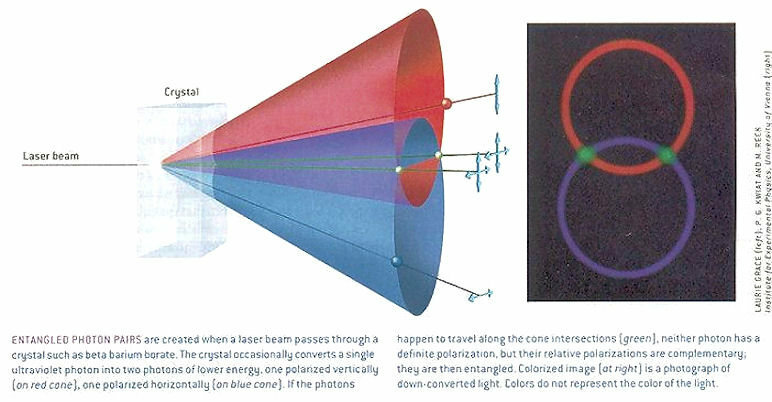 One scheme uses a transporter in which persons or non-living items are placed on the pad and dismantled particle by particle by a beam, with their atoms being patterned in a computer buffer and converted into another beam that is directed toward the destination where the things would be reassembled back into their original form (usually with no mistakes, Figure 04). 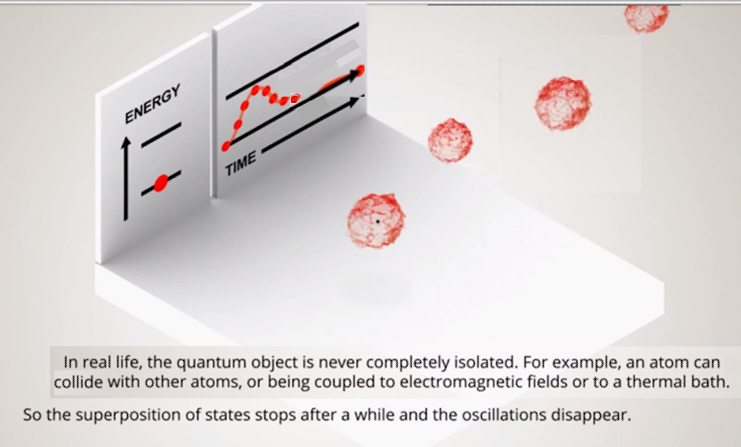 Quantum teleportation is possible in theory and lately (up to 2015) in practice with photons and partial atom, i.e., transporting only the electron shells without the nucleus. Entanglement Generation - Four maximally entangled states (Bell States) |S AB, |T1 AB, |T2 AB, |T3 AB are generated between systems A and B as shown in the section about "Entanglement". The subscript AB etc. is now necessary to avoid confusion with the presence of more than two spin spaces. State Preparation - The spin state to be teleported is prepared by Alice with the label "C" : | C = a |1 C + b |0 C .
|T3 AC (a |0 B + b |1 B) . This formula reveals that the two-spin entanglement has been transferred from system AB to AC with all the four possible Bell states linking to four possible superpositions of the original state vector | C now labeled under B. Bob knows there are four possibilities but doesn't know exactly which one. Alice then performs a measurement (Joint BSM) on the AC Bell states yielding one of the |S AC, |T1 AC, |T2 AC, or |T3 AC basis vector. Incidentally this step demonstrates the occurrence of monogamy in the transfer of maximal entanglement, i.e., the entanglement can be between AB or AC but not both at the same time. 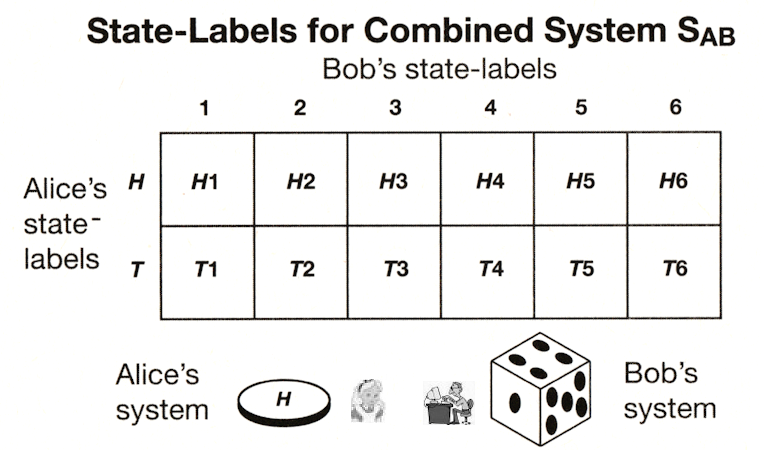 Conditional Transform - Alice and Bob agree on a two-bits code for each of the four AC Bell state, e.g., (00) for |S AC, (01) for |T1 AC, (10) for |T2 AC, and (11) for |T3 AC. She would send the code corresponding to the measurement to Bob via a classical channel. In principle, Alice can pick any one of the |S AB, |T1 AB, |T2 AB, or |T3 AB basis vectors to entangle with | C , but the resulting relationship would be re-arranged. Actually, there is no transfer of matter involved. The object of system C has not been physically moved to the location of system B; only its state has been conveyed over. N.B. 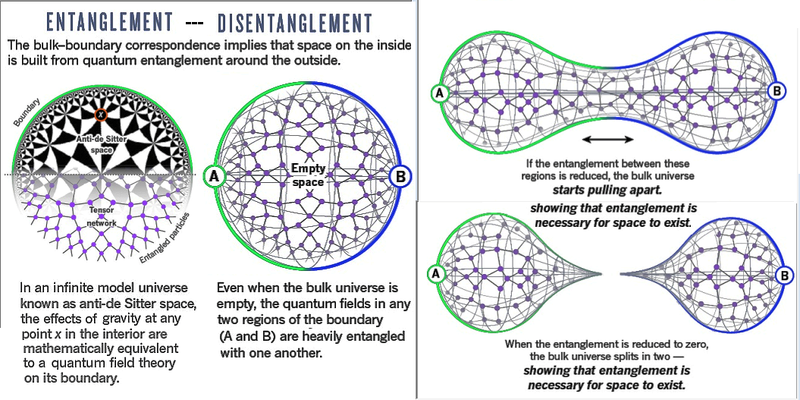 A very important limitation on entanglement is decoherence. The state of entanglement or superposition will dissolve via interaction with the environment in very short time interval from 10-6 to about a few seconds. 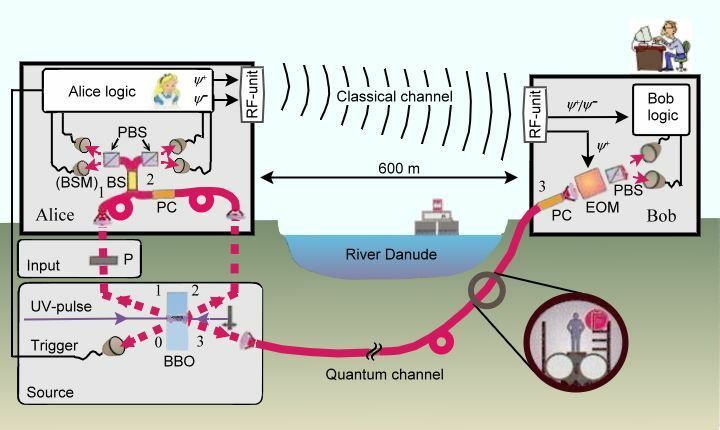 The actual experimental setup for teleportation is shown in Figure 07 completed successfully over a distance of 600 meters across the River Danube. According to the usual convention, Bob's photon 3 was transported inside an 800 meter long optical fibre in a public sewer located underneath the river, where it is exposed to temperature fluctuations and other environmental factors (the real world). 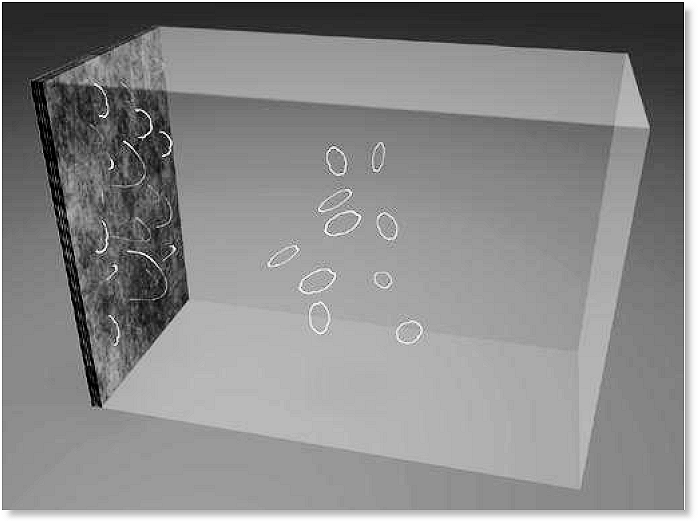 The entangled photon pairs (0,1) and (2,3) are created in the beta-barium borate (BBO) crystal by a pulsed UV laser. Photon 0 serves as the trigger. Photons 1 and 2 are guide into a optical-fibre beam splitter (BS) connected to the polarizing beam splitters (PBS) for Bell-state measurement (BSM). Photon 3 goes to Bob. Alice's logic electronics identify the Bell state and convey the result through the microwave channel (RF unit) to Bob's electro-optic modulator (EOM). Depending on the message, it either leaves the photon state unaltered or changes it to the opposite state. 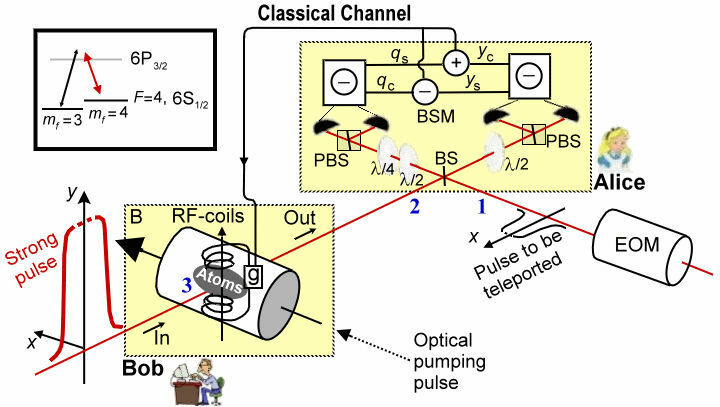 Note that because of the reduced velocity of light within the fibre-based quantum channel, the classical signal arrives about 1.5 microseconds before photon 3. Thus, there is enough time to set the EOM correctly before photon 3 arrives. Polarization rotation (which introduces errors) in the fibres is corrected by polarization controllers (PC) before each run of measurements. Polarization stability proved to be better than 10o on the fibre between Alice and Bob, corresponding to an ideal teleportation fidelity of 0.97. See origin paper "Communications: Quantum teleportation across the Danube" for detail. A 2-ms pulse of light is sent through the atomic sample at Bob's location and becomes entangled with the atoms. This is to initialize system 3, which consists of atoms initially optical pumped into the hyperfine energy level F = 4, mF = 4 state with a 4-ms pulse (see Figure 08). The pulse travels 0.5 m to Alice's location and entangle systems 2 and 3. System 2 is entangled on a beamsplitter (BS) with the object of teleportation (system 1) - a few-photon coherent pulse of light - generated by electro-optical modulator (EOM). A Bell measurement is performed, and the results are sent via a classical communication channel to Bob. There they are used to complete the teleportation onto atoms by shifting the atomic collective spin state with a pulse of radio-frequency (RF) magnetic field of 0.2-ms duration. After a delay of 0.1 ms, a verifying pulse is sent to read out the atomic state, in order to prove the successful teleportation. Note : The interaction between electron and nuclear spins splits the energy level by a small amount (~ 10-6 ev) forming the hyperfine structure (Figure 09). In essence, the polarization state of the photons is conveyed from Alice to Bob's location, where it is converted to the spin state of the electron (in the atoms, Figure 09). There is no teleportation of matter. The experiment was performed with 1012 caesium atoms in coherent spin state. It demonstrates the possibility of teleporting the state in moving carrier to stationary object for storage. See original paper "Quantum teleportation between light and matter" for detail. states |1 = S1/2 , |0 = D5/2 (see Figure 10). Ion 2 and 3 are entangled in one of the four Bell states. The teleported state is one of |1 , |0 , (|1 + |0 )/ , or (|1 + i|0 )/ . 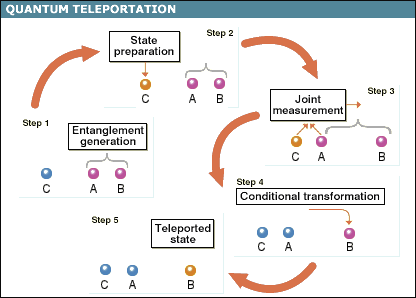 The actual experimental set-up is different from the other experiments, but the outcome is similar, i.e., the teleportation is logical instead of material. The mathematical formulas are implemented by electronic devices. This work is important for future development of quantum computing. 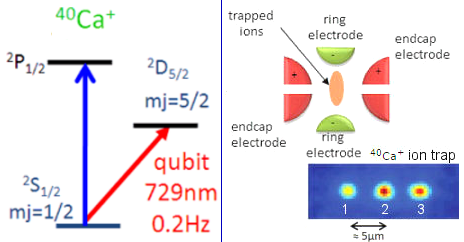 See original paper "Deterministic quantum teleportation with atoms" for detail. to high energy particles on the boundary. Since then many examples have been discovered to have such correspondence. The most famous one is the equivalence of "Type II String Theory" on the product space AdS5XS5, (i.e., 5 macroscopic AdS dimensions combines to 5 compactified microscopic dimensions), to the "Supersymmetric Yang-Mills Theory" on the 4-D boundary. A mathematical dictionary has been compiled to link the two perspectives. It is similar to the laser, which transforms a 2-D scrambled pattern into a recognizable 3-D image. This bulk to boundary correspondence as demonstrated by the holography invented in 1947, now becomes the "Holographic Principle" embraced by some physicists, who claim that it will become part of the foundations of new physics. Since the AdS space has played such a prominent role in the correspondence and its ramification, some of its properties are described briefly in the following. R(t) = (c/H) sin(Ht), where H = (| |/3)1/2c, is the cosmological constant and has a negative value signifying an attractive force (see insert in Figure 12). dL2 = sinh2(r) (d 2 + sin2 d 2). 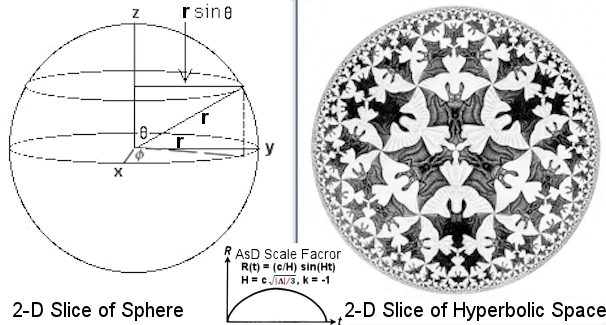 The circumference of a 2-D slice in a sphere at = /2 has a length of L1 = 2 r (Figure 12, left). 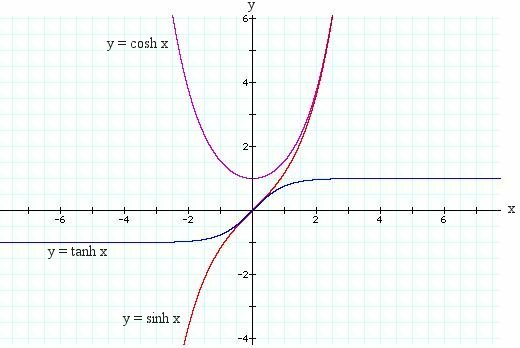 However, for the case of hyperbolic space L2 = 2 sinh(r) > L1. The geometry can be visualized by lining up the angels (or devils) along the circumference, as shown by the "Circle Limit" in Figure 12 (right) the L2 circumference can accommodate more of them (with invariant size) than the regular one along L1. 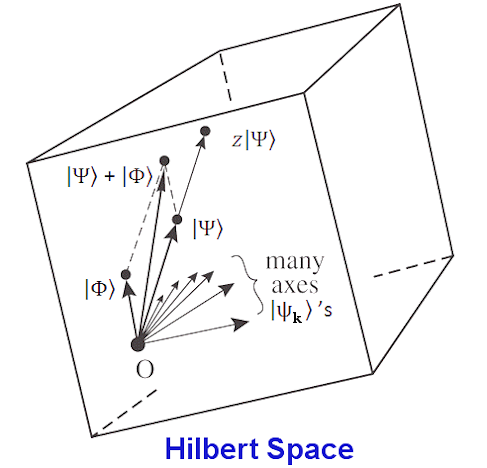 The AdS space-time in the correspondence is created by stacking up the hyperbolic slices along the time axis (Figure 13) and has nothing to do with the AdS scale factor nor the cosmological constant. 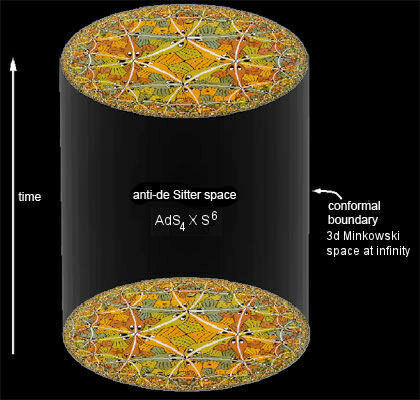 In short, the purported AdS space is an empty hyperbolic space, which becomes Minkowski space at the boundary infinitely faraway (similar to a small piece of flat area faraway from the center of the globe). This property is important for prescribing quantum theories, for all of them are formulated on the background of flat space-time. Anyway, when the correspondence has been promoted to the level of principle, it becomes a tool in vogue with quantum-gravity physicists especially about entanglement. (Figure 15). 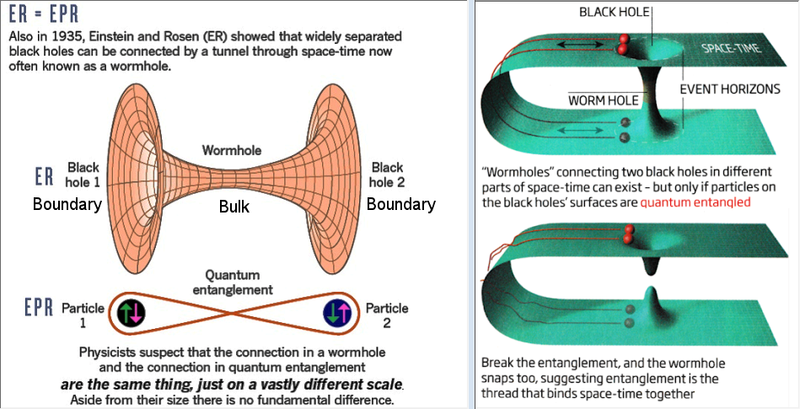 See original articles in "The Quantum Source of Space-time" and "Entangled Universe". "A" teleports the state to B and to C; thus, this tripartite network has succeeded in copying the state, i.e., B and C each hold a copy now. However, this operation violates the no cloning theorem, which is in turn a direct consequence of the linearity of quantum mechanics. If A and B share a maximally entangled state, even if one of the two parties shares any entanglement whatsoever with the third party C, the no cloning theorem is violated.